You'll be £30.00 closer to your next £10.00 credit when you purchase The Royal Naval Air Service in the First World War. What's this? 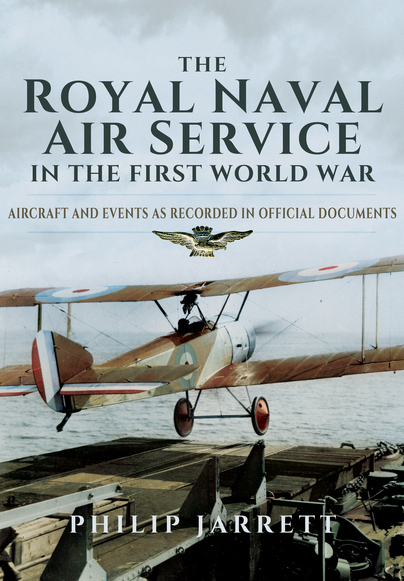 This book makes five original documents relating to the work of Britain's Royal Naval Air Service (RNAS) during the First World War readily available to students and historians. To enhance visual interest a large collection of photographs, many hitherto unpublished, has been added. Some of these relate directly to the aircraft and events mentioned in the documents, but others show developments before and after the periods covered. The five documents concerned are the Diary of Important Operations, Flanders, 1916; Disposition of Aircraft, 24 February, 1917; Royal Naval Air Service Communiques Nos 1 to 14; Truing-up of Aeroplanes: Issued by the Air Department on 1 September 1916; and The Grain drawings, a unique set of sketches and drawings made by a draughtsman at the RNAS seaplane repair station at Port Victoria, Isle of Grain, in Kent during the Great War. All of these documents offer an array of fascinating insight into Royal Naval Air Service practices during the Great War. Much of the content on display has never been printed before. This unique treasure trove of visual reference is sure to appeal to all serious First World War historians, students and enthusiasts. A good book presenting a lot of rarely seen material which will be of interest to the World War I enthusiast. Practically indispensable for those with a passion for WWI aviation. This book succeeds in the stated aim of not "present[ing] a coherent account of the RNAS." PHILIP Jarrett has brought together an eclectic mix of operational details, photographs, minutiae and trivia in this book of historical source material. This is not a blow by blow version of the activities of the Royal Naval Air Service during World War I, but rather an assemblage of selected historical documents that feel like they have been plucked from a dusty, cob-web covered archive where the inner most details of British naval aviation have lain hidden for almost 100 years or so. Jarrett’s book is simply a treasure trove for enthusiasts and professionals who would like to immerse themselves in the atmosphere of the RNAS in WWI. Click here to read the rest of this glowing review! Not intended as a definitive history or analysis of the RNAS and its role during the Great War, this is essentially a reproduction of five original documents relating to the Service's work in the conflict. It includes diaries, disposition lists, communiques, truing-up details and the Grain drawings - a unique set of sketches made by a draughtsman at the RNAS seaplane repair station of the Isle of Grain. With numerous photographs, many previously unpublished, and full-page reproductions of original documents, this is a must for serious students of the RNAS. I can't praise this book highly enough. Suffice to say that it contains more information than I've seen in a book for a long time and it's a snip at the asking price. A book to savour and to enjoy, and to ponder what might have been had the foolish decision to absorb the RNAS into the new RAF not been made. This is an absolute gem of a book that must be regarded as an essential addition to the collection of anyone with an interest in the RNAS or the development of air operations in the Great War. Astutely compiled by Philip Jarrett, it is a unique treasure trove of visual and written reference that offers an intriguing insight into early naval air service practices. PHILIP JARRETT is a freelance author, editor, sub-editor and consultant specialising in aviation. In 1971 he became editorial assistant on Aerospace, the Royal Aeronautical Society’s newly launched newspaper, and he was assistant editor of Aeroplane Monthly magazine from its launch in March 1973 until August 1980, and chief subeditor and then production editor of Flight International from August 1980 to October 1989. He currently contributes regularly to The Aviation Historian. As well as lecturing in both the UK and abroad, Philip has written and edited many books and produced numerous papers and articles. In December 2014 he was made an Honorary Companion of the Royal Aeronautical Society in recognition of his service and outstanding contributions to, and international standing in, the discipline of aviation history.